Our Fall Conference is over and we are geared up for our 4th Annual Hybrid Conference! The CASE office and the Professional Development Chair (Will Gordillo) and committee are pretty much always planning for at least one conference and typically for 2-3 at a time. Right now we are negotiating for 2017 and 2018! We are totally geared up for the Winter Hybrid but are already making plans for the July Legislative Summit and the 26th Annual conference next year in Atlanta! I am thankful we have such talented professionals to assist with this huge job and I am thankful we have members who want quality professional learning and support the CASE events! I am thankful for the great support and friendship to CASE of our two speakers, long time CASE friends, Dr. Joanne Cashman and Julie Weatherly, Esq. We hope you will consider hosting one of the virtual sites. It is critical that we get the information that will be presented out to general education, special education administrators and teachers — especial those just starting on their career ladder, as well as community and business people and parents! Click here for Hints for Virtual Sites. Click here for the flyer on the conference — remember you have two options: travel to the wonderfully warm Phoenix, Arizona, or be the host site for a virtual conference — same low price — and for just $50 you can have the DVD of the complete conference to use over and over and over! For more information and to register, Click here. I am also thankful for CASE having the respect of the GAO! 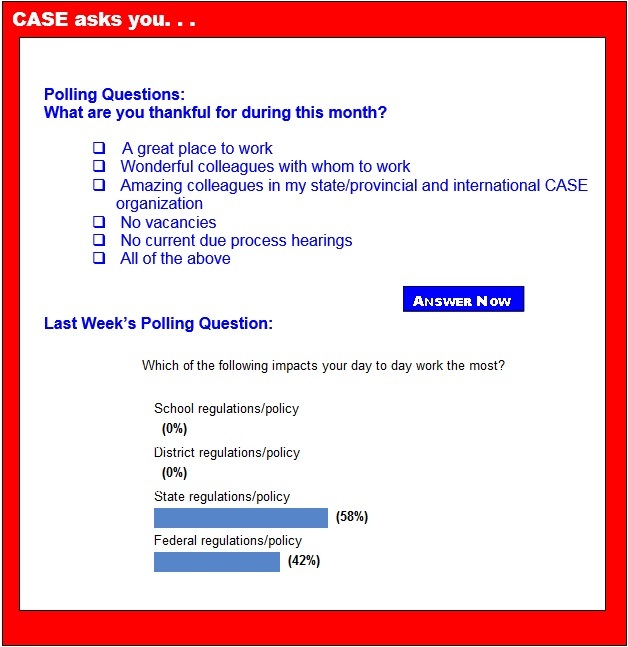 Last week's poll showed for 58 percent of you who answered the poll, state regulations give you daily aggravation and for 42 percent federal regulations are what impacts you daily. Last week at our CASE Board of directors' meeting and then for three breakout sessions, CASE members were able to discuss the paperwork and administrative issues of IDEA. What an opportunity and really privilege to be able to provide that input! Policy and legislative chair Phyllis Wolfram and her committee will be providing follow up to the GAO and of course to our members. I am thankful ... and I know you are too! The White House Fellows program 2015-2016 has officially launched online on Nov. 1, 2014! Open season is from Nov. 1, 2014 to January 15, 2015. The program's mission is to expose Fellows to first-hand, high-level experience in the Federal government. The program consists of a full-time work placement in the offices of Cabinet Secretaries, senior White House staff and other high-ranking Administration officials. The National Center for Families Learning has begun accepting nominations for the 2015 Toyota Family Teacher of the Year Award, which will present $20,000 to an exemplary teacher engaging families in education. Educators working with families through schools, libraries and many other community-based organizations will be considered, and nominations are due Dec. 31. With her long dark hair flying, Saorla Meenagh, 10, can execute a perfect switch leap, one leg out, one tucked under, her arms glued to her sides in classic Irish step-dancing style. Saorla, whose blue eyes, white skin, and sprinkle of freckles helped win her a modeling contract with a New York agency — on hold until her braces come off — also plays softball and Gaelic football, a soccer-like game her father, Seamus, a contractor, enjoyed when he was growing up in County Tyrone, Northern Ireland. For years, schools have grappled with how to help pupils who are struggling the most catch up to their classmates. In many cases, holding them back to repeat a grade hasn't worked. Neither has social promotion — allowing children to move to the next grade with their classmates, where they may fall further behind. So what would it take to get a pupil the needed help without the stigma of repeating a grade? Two schools in the Pattonville School District are shaking up schedules and class structures in an effort to find out. The children of wealthy parents hear millions more words in their first years of life than the children of low-income ones. That creates a vocabulary gap that never really closes: poor children lag behind in literacy from their first day of school. Researchers are looking at a low-cost way to help: sending three text messages a week to parents of pre-K students, at a cost of about $1 per family. And they have some early evidence that this program, which suggests easy ways to help kids pick up literacy skills, can work. The Obama administration is reminding schools of their wide-ranging responsibilities to students with disabilities who struggle with speech and other communication difficulties. In a guidance issued, federal officials said the nation's public schools have obligations under three separate laws to "ensure that communication with students with hearing, vision and speech disabilities is as effective as communication with all other students." While requirements under the Individuals with Disabilities Education Act, Americans with Disabilities Act and Section 504 of the Rehabilitation Act vary, schools must comply with all three laws to meet individual needs. The Department of Education is letting states apply to renew their waivers from No Child Left Behind, President George W. Bush's landmark education reform law, for three and in some cases four more years, but they'll have to do more to show they're turning around low-performing schools and closing student achievement gaps. Kids begin building the foundations for academic learning at an early age. In her Atlantic article, Alexandra Ossola explores how preschool children are beginning to make meaning out of the world around them, which translates into the ability down the line to grasp complicated math and science concepts. If you have dyslexia, learning basic reading, writing, and language skills can be a life-long struggle and a source of frustration. Dutch designer Christian Boer has stepped in to help dyslexic people by creating a specific typeface called Dyslexie that may make it easier to read. Boer, a graduate of Utrecht Art Academy, was inspired to create the typeface by his own struggles with dyslexia. The font looks a lot like a typical typeface, but is designed so that the difference between each character is more pronounced. The school environment in which teachers work is related to their expectations of students, according to a new study. "It is known that low teacher expectations are negatively associated with student achievement and school effectiveness. While we know that expectations are primarily determined by the specific characteristics of teachers, we have shown that the school environment also plays a determining role," says the lead author of the study. For many elementary teachers, fractions have traditionally sprung to mind lessons involving pizzas, pies, and chocolate bars, among other varieties of "wholes" that can be shared. But in what many experts are calling one of the biggest shifts associated with the Common Core State Standards for mathematics, more teachers are now being asked to emphasize fractions as points on a number line, rather than just parts of a whole, to underscore their relationships to integers.